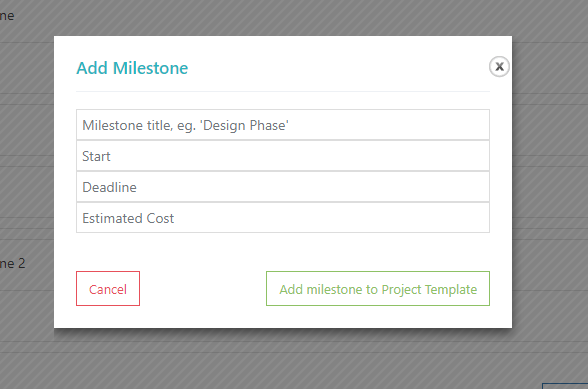 Projectopia also offers the option to apply pre-defined Milestone and Task templates to Quotes / Projects. This is useful if you frequently use the same or a similar set of Milestones / Tasks on your Quotes or Projects. Firstly, you need to create a template. 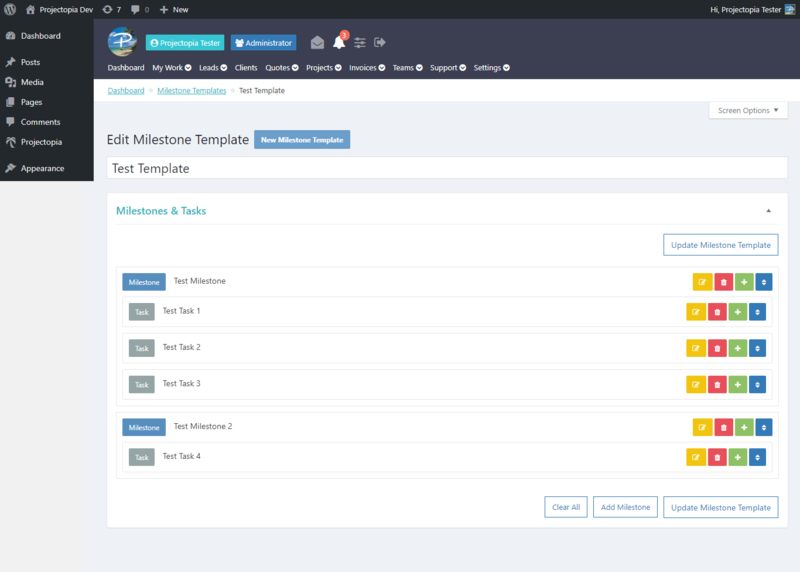 To do this, hover over the Quotes or Projects header in the admin menu and click Milestone / Task Templates, the click New Milestone / Task Template. 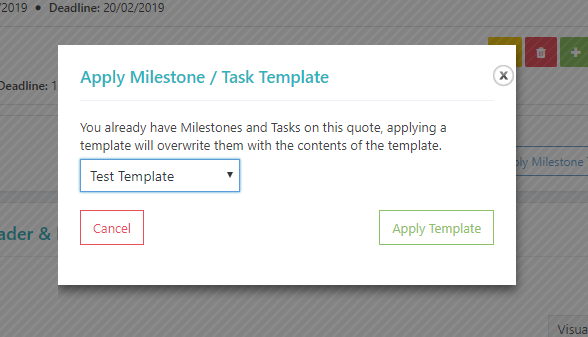 Set a title for your template, and then you can begin to add milestones and tasks to it by clicking the Add Milestone button. Fill in the details for the milestone, and click Add Milestone. 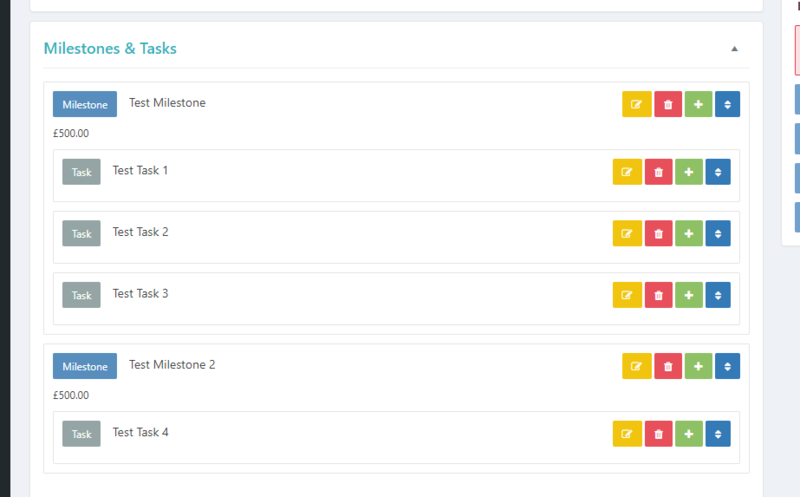 You can then add tasks to each milestone by clicking the green “plus” icons on each milestone. You can also edit, delete or reorder the Milestones / Tasks using the orange, red and blue icons on each element. When your template is complete, click the Update Milestone Template to save it and to make it available in Quotes / Projects. To apply an existing template to a quote or a project, enter the admin page for the quote project and locate the Milestones & Tasks metabox. In the bottom right of this metabox is a button, “Apply Milestone / Task Template”. Once clicked, you will be presented with a modal window to select which template you would like to apply. Choose your template and then click Apply Template. The pre-defined Milestones and Tasks will then be applied to your Quote / Project ready for you to enter any additional data required, such as dates and task time estimates.